David Baddiel struggles with fiction in translation in the Times Online. Now, say what you like about the irrelevance of authorial intention but the truth remains that I never meant the phrase “careers officer” to be heard in the reader's head a bit sarkily. An interesting, though lightweight, article about how David Baddiel discovers that his authorial intentions have not been faithfully carried out by his German translator... and about Baddiel's thoughts on the trustworthiness of the translation of fiction. Q. What is an author? Q. 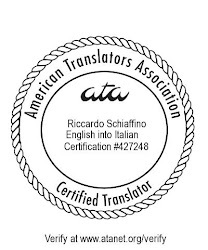 What is a translator? Art does not reside in the space between the creator's mind and the art itself; it also resides in the space between the art and its audience. Many people think it is definitive to go with the authorial intent and that art criticism need to go into farther than verifying authorial intent. But this ignores the space between art and its audience: where everyone who experiences art has something unique to take away from it and to share with others. Here is a radical notion: authors do not always understand their own art that well. They may not see or recognize qualities that are most important in the art to other people. In fact, this is almost ALWAYS the case. The author is not the ending point in dealing with a work of art; he or she is merely the starting point. This is why authorial criticism of translations of their works must be taken with a grain of salt, often a large grain of salt--and why excessive authorial interference in translation often has disastrous results. The fact is, the translator is situating the art within a new space for a new or expanded audience--and the translation is by definition not the same thing as the original text. The author who does not understand these things is not truly an artist, I think. When are two names 67% the same? When is DWI the same as murder?